Dr Andreadis works at several locations in and around the Sydney CBD. Her consulting rooms are at the Royal Prince Alfred Hospital Medical Centre in Newtown. 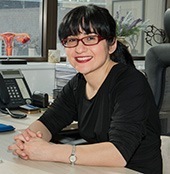 She operates at Genea (formerly Sydney IVF) in the Sydney CBD, Sydney Day Surgery in Newtown and St Luke’s Private Hospital in Potts Point. Dr Andreadis’ personal assistant can be contacted at the consulting rooms in Newtown, from Monday to Friday during business hours, 9.00am – 5.30pm (except on Wednesdays when office hours are 10.00am – 2.00pm). For all appointments and enquiries, please call (02) 9519 9707 during these hours. If you reach the recorded message, please leave your name and phone number. Dr Andreadis’ personal assistant will endeavour to call you back within 24-48 hours (excluding weekends and public holidays). If you are a Genea patient currently undergoing a treatment cycle, please call the after-hours mobile number provided to you by the Genea nurses. When attending a consultation, 2 hours free parking can be found on Northwood Street which is a few minutes walk from the clinic. Alternatively, there is secure undercover paid parking below the building (enter carpark via Elizabeth Avenue) or metered street parking in front of the building and on the surrounding roads. Dr Andreadis also has a Facebook page here, or can be contacted via the form below.